Then you definately have an odour problem in you crib! I've been there. Tried everything. Now I know what it is one can do to get rid of that foul smell indoors. But its too tiring. It takes away all your energy. I saw this ad in Martha Stewart Living, my numero uno magazine. 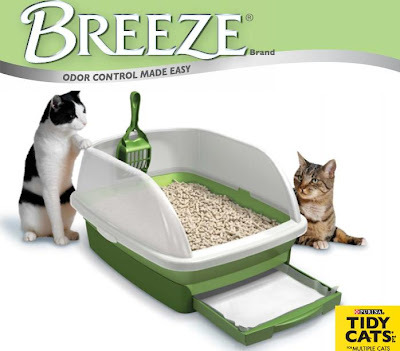 A product that was brought to consumers by Purina, my yet again numero uno product for cats. Its called Breeze. It is exactly what its called. I really wish I could order one online, I'm pretty sure we don't have it here or will have it anytime soon. And somehow I have the feeling it will yet again cause my cat budget to rise. Not only for the various parts I have to get, but the delivery charges due to its weight, and having to do so every month or so! It consists of the litter box itself, litter pellets, and the odor pads. The litter pellets used are different from the ones we usually get from the supermarket, shaped differently not like the usual tiny pebbles. Odour wipes should be changed once every week. So there, if you need any more elaboration on this check out Breeze .